A screen grab of the new Belfast Group Poetry Networks website home page. 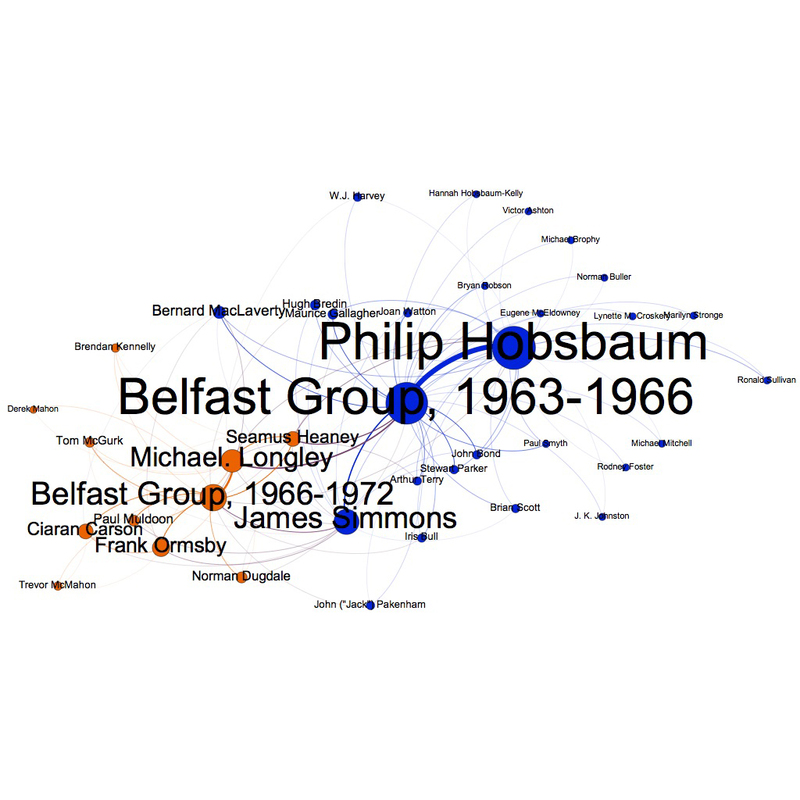 This network visualization shows how authors and owners of various Group sheets are connected over the two time periods of the Belfast Group (1963-1966 and 1966-1972). The nodes are sized by the number of connections that link each person. Created by Brian Croxall, Emory Center for Digital Scholarship. Senior software engineer and project lead Rebecca Sutton Koeser proposed the “Networking the Belfast Group” project to ECDS in 2012, but she first started experimenting with the idea in 2010, when members of her team were given time to explore new technologies and possible projects. She noticed that four Irish collections held by MARBL have an index of correspondence, and she began harvesting the names to map the connections. The team went through the finding aids, tagging the names of poets, their places of birth and residence, locations mentioned in their poems, and organizations. The software Koeser wrote allowed team members to complete this process more easily, and it also communicates with an international cataloging system that assigns a permanent ID tag to each poet and author. Even abbreviations of names could be tagged, so if Seamus Heaney was referred to as S.H. or SH, those abbreviations could be identified as Heaney – something that is obvious in context to a human, but not obvious to a computer, Koeser says. Once those tags were in place, Koeser then wrote software that could infer relationships among them from the data in the finding aid, which was then output in RDF, a linked data format. A new website called Belfast Group Poetry Networks will make it easier to understand the connections between Irish writers, particularly members of the mid-1960s Belfast Group, using open-source software created by the Emory Center for Digital Scholarship (ECDS). 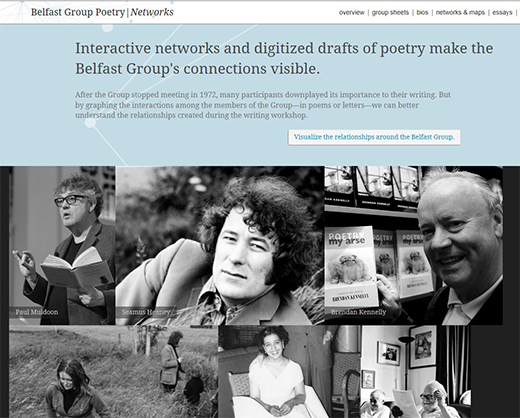 Belfast Group Poetry Networks, launching July 7, provides an interactive way to explore the poets’ literary and social networks, based on correspondence, shared poems at workshops, and mentions of names and places in poems and throughout their personal papers. The new site builds on and extends the previous Belfast Group webpage, created in 2000 by the Lewis H. Beck Center for Electronic Collections (now part of ECDS), as well as EmoryFindingAids, a repository of collection descriptions for manuscript collections in Emory's Manuscript, Archives and Rare Book Library (MARBL). Original group members included Seamus Heaney and Marie Devlin (who later married), Edna Broderick, Bernard MacLaverty, Stewart Parker, James Simmons and Arthur Terry. Heaney and other members took over running the group when Hobsbaum moved to Glasgow in 1966. Over the years, the group counted Ciaran Carson, Brendan Kennelly, Michael Longley (who married Edna Broderick), Derek Mahon and Paul Muldoon among its members. The project for the Beck Center’s original Belfast Group website began in the mid-1990s, when a small number of poets whose papers are held by MARBL gave permission for their group sheets to be digitized to create an electronic poetry collection. The updated site features the group sheets of the poets who gave permission, including Heaney, Muldoon, Michael Longley, Hobsbaum, Carson, Simmons and Kennelly. The papers of one poet often contain group sheets written by other poets. “In our Muldoon collection, we have Heaney’s group sheets because Muldoon was there when Heaney read, and in Simmons’ papers, we have Longley’s group sheets,” says ECDS digital humanities strategist Brian Croxall, who served as deputy project leader and project manager. Other features of the website include biographies of several Belfast Group members, generated from the MARBL finding aids (if MARBL doesn’t have the poet’s papers, the software will pull in the biography from Wikipedia); network graphs of the authors’ connections to the Belfast Group and to other writers; maps of places connected to people associated with the Belfast Group; and essays about both archival biases and women in the Belfast Group. The idea to update the Belfast Group site started with senior software engineer and project lead Rebecca Sutton Koeser, who completed a majority of the software development. She wanted to provide a new way to visualize some of the information found in the finding aids, which list the contents of poets’ papers and archives. Online finding aids are constructed more for humans to read rather than computers, Croxall says, even though there is data embedded. The software Koeser developed is open-source and can be used by other archives to show similar connections among their collections. Anne Donlon, a CLIR postdoctoral fellow in MARBL and ECDS, is using the software for preliminary work with MARBL’s African American collections to connect the writers who wrote, owned or inscribed books to each other, Koeser says. In addition to Croxall and Koeser, team members included digital text specialist and original Belfast Group website manager Alice Hickcox, digital archivist Elizabeth Russey Roke, and senior software manager Kevin Glover. The team also plans to publish the data from the site in Emory’s Dataverse Network and on Figshare for others to use in their research.